The National Aeronautics and Space Administration's Surveyor I spacecraft made a perfect low-speed, three-point landing on the Moon on June 1, 1966, after a 63-hour, 36-minute flight from Cape Kennedy. During the following six weeks -- before the Sun set, rose again 14 Earth days later and set a second time on Surveyor's landing site in the Ocean of Storms -- the spacecraft's survey television camera scanned for transmission to ground communications stations 11,150 high-resolution pictures of the lunar surface. From the pictures were derived the representative colors of the Moon's surface, an accurate view of the terrain up to one-and-one-half miles surrounding the spacecraft, the effect of the landing upon the surface and visual evidence of lunar environmental damage to Earth-made objects. By July 13, Surveyor I's 42nd day on the Moon, America's first remote observatory had done the unexpected. It had survived the intense heat of the day (250 degrees Fahrenheit), the cold of the two-week-long lunar night (minus 260 degrees F.) and a second full Moon day. Surveyor continued to accept Earth commands and transmit TV pictures through the end of the second Moon day even though its main battery, not expected to endure the rigors of the lunar environment for so long a time, had been faltering for nearly a week. Whether it will function a third lunar day is not yet known, but the possibility is considered remote. Designed and built for NASA by the Highes Aircraft Company of Culver City, California, under technical direction of the Jet Propulsion Laboratory, Surveyor I greatly exceeded its objectives in gathering surface data necessary to the Apollo manned lunar landing program. The first of seven lunar soft landing missions planned for 1966 and 1967, Surveyor I was designated an engineering test flight for demonstration of the Atlas-Centaur launch vehicle; mid-course and terminal maneuvers by the spacecraft; a radarand-rocket-controlled soft landing; and maintenance of constant communications between the spacecraft and the Deep Space Network ground stations during the flight and after landing. Surveyor I lifted off Pad 36-A at Cape Kennedy within one second of its planned launch time--7:41:01 a.m. Pacific Daylight Time--on May 30. The perfect countdown was followed by a boost into space by the Atlas-Centaur that would have put the spacecraft on the Moon within 250 miles of the aiming point. The precise launch made the requirement for a trajectory correction some 16 hours later one of minimum proportion. At the mid-course maneuver, the velocity change was 45 miles per hour, only a fraction of which was applied to the slight injection error. All launch vehicle and spacecraft events thorough Canopus acquisition occurred satisfactorily and at nominal times with the exception of the deployment of one of Surveyor's two low-gain omnidirectional antennas. Both antennas and the spacecraft's three landing legs were commanded by the Centaur programmer about 12 minutes after liftoff to extend from their folded launch position to the flight and landing position. Telemetry from the spacecraft indicated that Antenna A apparently had not deployed fully, if at all. Two-way communications lock was achieved by the Deep Space Net station in Johannesburg, South Africa, at liftoff plus 28 minutes, transferring control of the mission from the Eastern Test Range to the Space Flight Operations Facility at the Jet Propulsion Laboratory in Pasadena, California. Commands were transmitted immediately to Surveyor to deploy the antenna in question, but telemetry and signal strength readings indicated no change. Although the minor failure was not expected to jeopardize the mission--either from the standpoint of communications or the slight change in the spacecraft's center of gravity --the exact position of Antenna A remained undetermined throughout the flight, a concern in itself. Surveyor's original aiming point was 3.25 degrees south of the lunar equator and 43.83 degrees W. Longitude in the southwest portion of the Ocean of Storms. In planning the mid-course maneuver, executed at 11:45 p.m. PDT May 30, the Surveyor space science analysis team selected a new target about one degree farther north in latitude. The new coordinates were 2.33 degrees South, 43.83 degrees West, a point scientists expected to be smooth enough for a safe landing. Tracking data throughout the remainder of the flight indicated Surveyor landed at 2.411 degrees South and 43.345 degrees West, about nine miles from the modified aiming point. The critical terminal descent began 31 minutes and 2000 miles from the Moon at 10:46 p.m. PDT June 1 with roll and yaw maneuvers to align Surveyor's retro rocket with its approach direction, just five degrees from local lunar vertical. At 11:14 and 39 seconds, an altitude marking radar sensed the nearness of the Moon--59.35 miles altitude--and started the automatic sequence that fired the spacecraft's main retro motor 10 seconds later. The 9000-pound-thrust solid propellant rocket ignited at two minutes and 46 seconds before touchdown when Surveyor I was 46.75 miles above the Moon and traveling at a velocity of 5840 miles per hour. The 39-second main retro phase slowed the spacecraft to 267 miles an hour at 35,000 feet altitude. The rocket motor case was ejected at 31,000 feet, and three smaller rocket engines, which stabilized the spacecraft during main retro fire and earlier powered the mid-course maneuver, continued to slow the descent. Throttled by information from Surveyor's radar altimeter and doppler velocity sensor (RADVS), the verniers reduced the spacecraft's speed to 71.4 miles per hour at 1000 feet altitude and 2.8 miles an hour when they cut off about 10 feet above the surface. Surveyor free-fell the last 10 feet of the flight, its first leg touching the lunar surface at 11:17:35.651 p.m. PDT. Within 19 milliseconds it had three feet on the Moon. Landing speed was about 7.5 miles per hour. Strain gauge readings from the three landing legs recorded a "second touchdown" less than one second later, indicating that the spacecraft bounced about four or five inches. Television pictures taken by Surveyor during the next several weeks showed that at least one of the three crushable blocks under its frame gouged the lunar surface as the shock absorbers compressed at touchdown. The aluminum honey-comb block made a "cookie cutter" imprint on the Moon just below the spacecraft. After a series of engineering interrogations to confirm that all spacecraft systems had survived the landing, Surveyor I took the first of 11,150 pictures at 11:53 p.m. PDT June 1. The 200-scan-line, wide-angle (25-degree field of view) picture showed a portion of the spacecraft framed against the surface of Moon. Thirteen additional 200-line pictures were transmitted to the Pioneer station of the Goldstone Space Communications Complex in California before the solar panel was positioned for power conversion and Surveyor's high-gain antenna was pointed at the Earth for transmission of higher quality 600-line pictures. With the high-gain antenna so positioned and the ease with which it was maneuvered during the following days, the Surveyor camera did not return to the 200-line mode until the last day of operation on July 13. Picture count at lunar sunset on June 14 was 200-line pictures, 14; 600-line pictures, 10,324. A scan conversion system at JPL made it possible to display Surveyor pictures in real time on conventional TV monitors at the Laboratory as they were relayed from the Moon via microwave from Goldstone. During the night of June 1 and the morning hours of June 2 when Surveyor took its first 144 pictures, commercial television networks further relayed the live lunar program throughout the nation. The Early Bird satellite carried the pictures even further--to Europe. Nearly all the television pictures were commanded and recorded by the Goldstone station during communications periods that varied from 8 to 10 hours each day. A few picture sequences originated at the Deep Space Net station at Canberra, Australia, which, along with the Johannesburg station, served as prime monitors of engineering telemetry from Surveyor. The Madrid, Spain, station and the Mars Site (210-foot antenna) at Goldstone were backup stations during the mission. More than 82,000 ground commands to Surveyor were transmitted from the Goldstone station from May 30 to June 14. During its most productive session over Goldstone, June 10, Surveyor took 1758 pictures of the Moon and received and acted upon more than 12,000 commands. Six hours and 37 minutes of the 10-hour, 20-minute communications pass were devoted to picture transmission. Early in the mission, it was expected that the camera would necessarily be shut down for several days at lunar mid-day because of the extreme heat. However, at lunar high noon on June 7, as the Moon's surface temperature approached 250 degrees the camera was shaded by the solar panel and the high-gain antenna and continued to operate within its thermal limits. The camera was de-activated June 8 and 9 when it was exposed to the Sun. In addition to the lunar surface pictures taken by Surveyor's camera from its vantage point only four feet above the surface, the spacecraft performed a number of other postlanding operations. Moon's-eye views of the bright stars Sirius and Canopus were photographed by the camera in an effort to ascertain more closely the exact location of Surveyor on the lunar surface. On June 6, an attempt was made to photograph a portion of the Earth, but the planet was just out of view, above the elevation range of the tilting mirror of the camera. Several attempts were made to disturb the lunar surface or create a small dust cloud near one of the spacecraft's three landing feet by firing bursts of nitrogen gas from Surveyor's attitude control jets. No disturbance or dust was discernible in TV pictures taken during and after the firings. Because of the continuing excellent condition of the spacecraft after it had operated on the Moon for more than a week, it became apparent that Surveyor had a strong chance of surviving the lunar night. This possibility was taken into account during formulation of plans for the spacecraft's operation on the final day of sunlight June 14. During the final Goldstone pass, the camera recorded another 523 pictures as the Sun sank lower on the horizon. Many of the pictures taken with the low Sun behind the spacecraft showed perfect silhouettes of Surveyor shadowed against the Moon's surface. At lunar sunset, 9:18 a.m. PDT June 14, the camera was commanded to point toward that portion of the horizon where the fireball disappeared and a number of pictures were taken of the solar corona, the Sun's upper atmosphere. Surveyor I made its last picture of the first lunar day at 9:37 a.m. PDT after night had fallen on the spacecraft's small segment of the Ocean of Storms. It portrayed Surveyor's footpad No. 2 lighted only by the Sun's reflection off the Earth. The camera's shutter, normally providing an exposure time of 150 milliseconds, was held open for four minutes for the single "Earthshine" picture. After taking 10,338 pictures during 12 1/2 days of operation on the lunar surface, Surveyor's camera was shut down for the duration of the night. Temperatures already were dropping rapidly on the spacecraft. The battery, however, was nearly fully charged with a capacity of 162 ampere hours. Maximum capacity of the battery is 165 hours. At touchdown on June 1, telemetry indicated 57 ampere hours. For the following two days, the spacecraft was queried periodically concerning its condition--voltages, temperatures and battery power capacity--by round-the-world stations of the Deep Space Network. Surveyor went deeper into "hibernation" on June 16, conserving its stored electrical energy and expending only enough to keep itself warm during the long, cold night. The only systems functioning in the power-conservation fashion were the two radio receivers and the command decoder to accept commands from space communications stations on Earth. The solar panel had been positioned so that at dawn the Sun would not strike the power-converting cells, sending a sudden surge of current into the chilled electronics systems. It was expected that several days after dawn Surveyor would warm up to the point where the battery would provide the spacecraft with enough power to permit reception of commands and movement of the solar panel toward the Sun for a slow and easy battery charge. Pointing the solar panel toward the western lunar sky above the horizon had a second purpose. The panel and the highgain antenna, positioned nearly parallel to the mast atop which they are mounted, would provide a surface area large enough to cast long shadows on the lunar terrain. 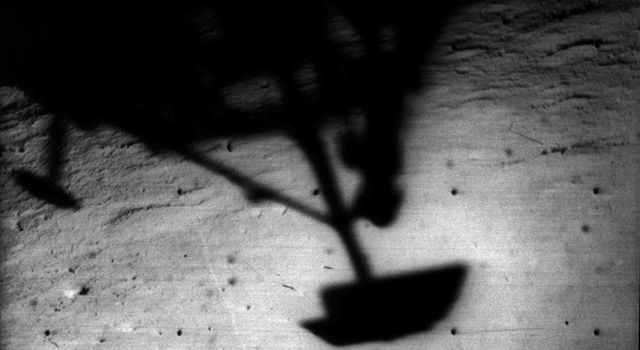 Should Surveyor fail to come back to life, the shadows could be photographed from above by the first Lunar Orbiter spacecraft. On June 28, just a few hours before sunrise on Surveyor, commands to turn on the spacecraft transmitter were sent from the tracking station at Goldstone. No response was received. For several hours each day thereafter, Goldstone sent the same commands. The station at Canberra took over the wake-up duties on July 3 and finally aroused Surveyor from its power-conserving sleep at 4:29 a.m. PDT on July 6. In preparation for picture-taking activities during the second lunar day, engineers and scientists at JPL sent commands via Goldstone on July 7 to operate Surveyor's camera. Twentyfour pictures were taken as the camera proved to be in good working condition. It was planned to use the camera again during the final three days before sunset, expected about 7:30 p.m. PDT on July 13. Possible failure of the battery because of excessive heat was detected two days later by JPL and Hughes Aircraft Company engineers monitoring temperatures, voltages and other readings from the telemetry. Battery temperature began rising rapidly and by 1 p.m. PDT on July 9 had reached 129 degrees F., just 12 degrees below the maximum design limit. Three hours later, the temperature was at 134 degrees but rising at a lower rate because the solar panel had been turned almost completely away from the Sun to reduce the battery charging rate and, as a result, the internal temperature of the battery. Emergency measures were taken to take advantage of what was then believed to be the last few hours of Surveyor I's operational life. Responding to commands from the Deep Space Net station at Canberra, the TV camera took 38 pictures of the lunar surface. An attempt was made to fire the three liquid propellant rocket engines at a low thrust level to stir up Moon dust or dig a hole in the surface just below the rocket nozzles. The attempt was unsuccessful because of the inability to turn on, by ground command, power circuits that operated the engine valves to release propellants into the thrust chambers. Commands also were transmitted from Canberra to turn on Surveyor's approach television camera, which was designed for but not used during final phase of the flight from Earth to the Moon. No video information was received, but telemetry indicated that the camera electronics did function properly. By the time operations were concluded on July 9, the battery temperature had climbed to and leveled off at 139.8 degrees. At noon the following day, the temperature had fallen to 130 degrees and, 24 hours later, to 115 degrees, well within the operating range of the battery. The battery was designed to operate at temperatures from 40 to 125 degrees F.
As the battery temperature decreased, the solar panel was repositioned periodically to step up the charge until full charging rate was once again possible. Engineers believe the battery problem originated with an internal short which generated internal heat. Telemetry indicated that battery pressure fluctuated and that the sealed battery case had ruptured. Reason for the battery's brief recovery is not known. With the battery problem unsolved but less critical, picture-taking was resumed on the morning of July 12 when 257 TV shots of the lunar surface were received at the Goldstone station. A number of the pictures revealed visually for the first time lunar environmental damage to Surveyor. The pictures showed that one of the mirrored glass thermal radiators atop Compartment A, used to dissipate heat from temperature-sensitive electronics, shattered during the long, cold night when it was subjected to temperatures approaching minus 300 degrees F. At these temperatures, the stresses. The compartment, covered by 36 of the glass radiators, houses two radio receivers, two transmitters, the main battery and other equipment designed to operate between 40 and 125 degrees F. None of 24 glass radiators on a second compartment were damaged by the extreme cold. The shattered segment of glass, representing less than one-sixtieth of the total radiator area, had a negligible effect on spacecraft performance. One-hundred fifty more pictures were recorded at Canberra and Johannesburg on the night of July 12 to complete the record of "shadow progression". About a dozen pictures were taken each hour upon command from the overseas stations. Areas portrayed were illuminated by the low-angle Sun and show shadow growth hour by hour. Surveyor I entered its 42nd day with a weak, but functioning, battery. After 334 pictures were received at Goldstone, the high-gain antenna and solar panel were again positioned as they were at the first lunar sunset June 14. When control of Surveyor passed to the Johannesburg station just a few hours before dark on the landing site, the spacecraft's camera was made ready for 200-scan-line pictures of the solar corona. Sunset was expected at 7:38 p.m. PDT on July 13. At about seven o'clock, two test pictures were taken to insure that the camera was working properly. (The 200-line mode had not been used since June 2 when the high-gain antenna was pointed toward Earth for the first time.) There were to follow several dozen carefully timed pictures of the western horizon as the Sun disappeared. The camera would pan across the sky above the horizon without pointing directly at the Sun itself. As each of the next few pictures were transmitted from Surveyor, spacecraft telemetry showed large battery voltage drops indicating that the battery, then operating without the support of solar power, was dying. Night-time temperatures, dropping rapidly at sunset, pushed the battery voltage still lower. The Johannesburg station lost communications with Surveyor at a few minutes before 8 p.m. PDT after the ninth 200-line picture was recorded. The loss of radio lock occurred before the corona could be photographed. Throughout the night and until 5:30 a.m. on July 14, engineers at JPL and at the Johannesburg station attempted to resume communications with Surveyor. The effort was abandoned when the Moon was out of view of the South African station. The possibility that Surveyor I would survive a second lunar night was believed to be very remote. However, project officials did not discount the chance that the spacecraft could come back to life during the afternoon of the next lunar day (second week of August). Although the operational phases of the mission ended July 14, Deep Space Network stations are expected to tune in on Surveyor again in the event the spacecraft is revived by the generation of power by the solar cells. Surveyor's TV picture total now reads: First lunar day, 10,338; second lunar day, 812. Surveyor I transmitted its last picture to Earth less than one week before the second flight spacecraft was shipped to Cape Kennedy from the Hughes Aircraft Company facility in ElSegundo, California.